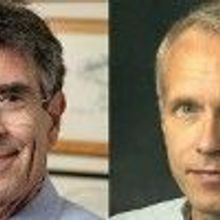 Robert J. Lefkowitz and Brian K. Kobilka take home this year’s Nobel Prize for Chemistry for revealing how membrane receptors sense and respond to chemical signals. Irving Geis’s revolutionary painting of sperm whale myoglobin illuminated the nascent field of protein structure. Cyclic peptides, discovered in an African tea used to speed labor and delivery, may hold potential as drug-stabilizing scaffolds, antibiotics, and anticancer drugs.